I will be taking a short break from the blog due to illness. It hasn’t been my day.This morning, when I was on my way back to Lindlar a car pulled out of a side street and crashed into me. The brand new Opel Adam I had rented got a big dent in the front and I got a big fright. Luckily, no-one got hurt and I was able to drive the car to the nearest rental station. My family then gave me a lift to a train station from where I got a direct train to the airport. No Lindlar today. I took a direct train to the airport because nowadays it is risky to rely on connections when traveling with Deutsche Bahn. For the day that was in it, I shouldn’t have been surprised that the train broke down just 10 minutes out of the airport, we all had to wait and then change over to a different train. I’m now sitting in the airport waiting or the plane to take off in about an hour and a half. I don’t want to think about it too much but I’m wondering what’ll happen next. Even if everything goes right tonight, I’ll be landing in Dublin just before midnight. Knowing I’ll be traveling with Ryanair, anything is possible. Nothing will surprise me. This is a classic. 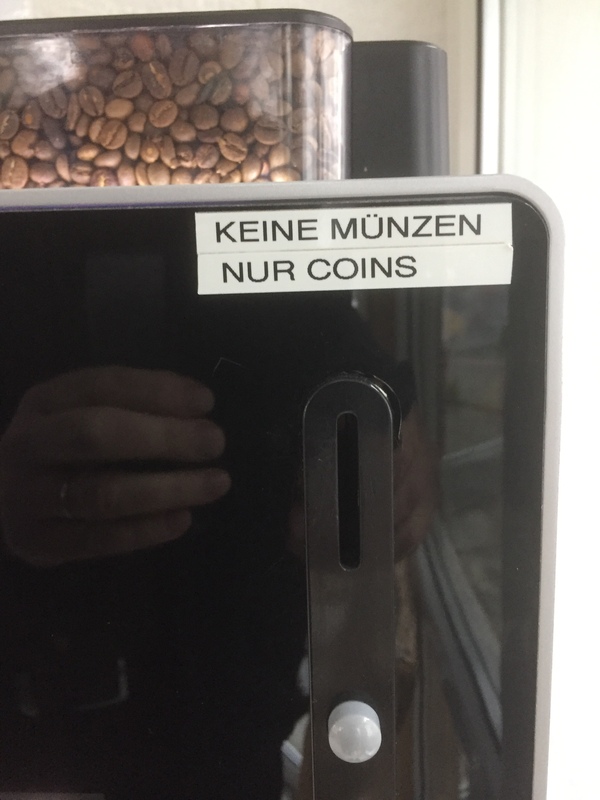 A sign on a coffee machine in Germany advising potential purchasers of different types of coffee to use ‘no coins (keine Münzen), only (nur) coins’. After a short period of confusion, I realised that ‘coins’ in this case didn’t mean ‘coins’ but ‘token’. There is a name for this linguistic phenomenon, you could call it ‘over-translating’ or maybe ‘adapting a foreign word incorrectly’, but I can’t think about it. For reasons known only to themselves, they did not want to use the perfectly adequate word ‘Wertmarke’ and looked for a cool, short, English alternative – and picked the wrong one. You might have guessed – I am in Germany today visiting a therapy centre I had heard about an awful lot from many people. All telling me that Lindlar was the place to go for Speech and Language Therapy (SALT or SLT). Pádraig is now at a stage where he desperately needs to find ways to communicate in a much more efficient way and where he needs to develop his voice. The HSE-employed SLTs who had treated him on and off have been off for close to three quarters of a year, I’d say. The last SLT working with him is now on maternity leave with no replacement or cover in sight. We have been trying extremely hard to find an SLT but all of our best efforts have been frustrated by what amounts to a denial of service. SLTs in both the voluntary and the professional sectors have told us that they cannot treat Pádraig. Isn’t that absolutely amazing, incredible and shocking? The meeting today in Lindlar was really promising and I hope to meet up with a family tomorrow who I got to know a little and whose son has been treated in the centre for several years. I spent tonight with my German family. We had a really good night together with good company and good conversation, something to be really grateful for. This is of no particular interest, really, but it is a curious, even a bit quirky story. Using words to represent letters of the alphabet when communicating using bad quality radio communication. The letter ‘R’ is used to acknowledge that a message has been received. While the British tried to push ‘Robert’, it was the U.S. who pushed ‘Roger’ and succeded – and who established the phrase ‘Roger that’ to acknowledge the receipt of a radio message. Then, in the 1950s, NATO standardised the words used to represent the alphabet and ‘Roger’ became ‘Romeo’. But, ‘Romeo that’ doesn’t really work for some reason, wouldn’t you agree? So what is it that makes us stick to old habits? Just watched a completely pointless movie on Netflix. Close to 100 minutes of the New Year down the drain. But then, not everything needs an apparent purpose. In fact, at times it’s the stuff that doesn’t seem to have an apparent purpose that turns out to be the most valuable. Here I am trying to write down something worth noting. Whether I did watch a movie or not, and whether it was a movie worth watching, and whether or not it’s stuff that seems to have an apparent purpose eventually turns out to have a deeper than just the ‘apparent’ purpose…. who cares. What about Pádraig’s day? My day? Busy: with PA’s and his physio back in action, and a relaxing massage by a very kind and friendly neighbour. Great food. A nap. A walk in the park. Nearly an hour on the MOTOMed. At the end of one of these days, we’re all pretty exhausted. A day that starts before 6am, doesn’t finish in the evening but continues through the night, though much more relaxed. Anything noteworthy? Not really. A bit like that movie I watched. If I can do this, I can do anything. 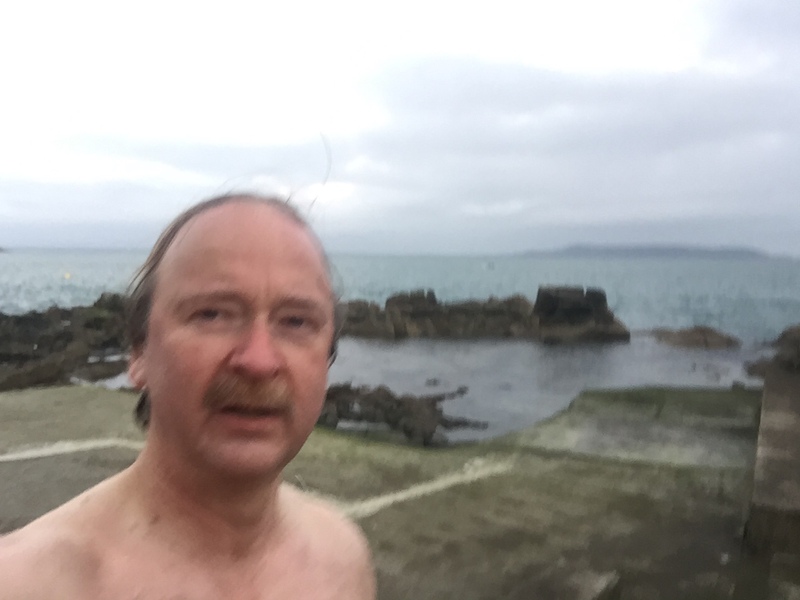 I couldn’t believe how energised I felt this morning after a very good friend of mine and I had got out of the sea after a (*very* short) swim at the 40 foot. It was brilliant. In the meantime, Pádraig discovered a new exercise: stretching out his leg and rotating his foot to the rhythm of the music. My New Year resolution is to do this every day: getting up early. Energised. His is to share his strength with us. We’re ready for the Dreamboat. Just before the year ends and the new one begins, I want to thank you, also and especially on behalf of Pádraig, for your support in the past year and wish you all the best for the New Year. It’ll be a magic one. One when the Dreamboat will go down that stream, despite any obstacles that might be in its way, with thousands of Dreamboaters joining from around the world helping us with their energy and love to move it along to where there is justice and inclusion, not leaving anybody behind. Would you have any good or strange New Year’s resolutions? Pádraig has become much more active. There has been a pronounced change in his movement. He doesn’t sit still in his chair anymore. He also moves around in his bed. Both for himself and for us this is something quite new and something we will have to learn about. It’ll require a big chance in mind for everybody dealing and being with Pádraig. This morning I had one of these moments when I listened to a song that I had listened to a million times. It was performed by Irish group The Kilkennys, not by the man himself. The song was Blown’ in the Wind. 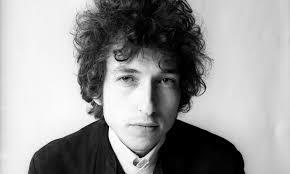 Dylan asks a lot of the essential questions, like how many roads must a man walk down before you can call him a man? – All the answers to these questions are, according to Bob, Blownin in the Winds. Well, they are not. People do not have to die, canon balls don’t have to fly, and I can hear people cry. We know what the answers are to make this happen, they are not blowing in the wind. I am still in awe at Pádraig’s ability to use the exercise equipment in Tolka Park. It was another one of these moments when I realised that it is mostly us who are limiting his experiences by our (lack of) expectations. We had tried this push-out machine with him by helping Pádraig to hold on to the handle bars and had then moved the bars with the weights out to help him get a feel for how this works. 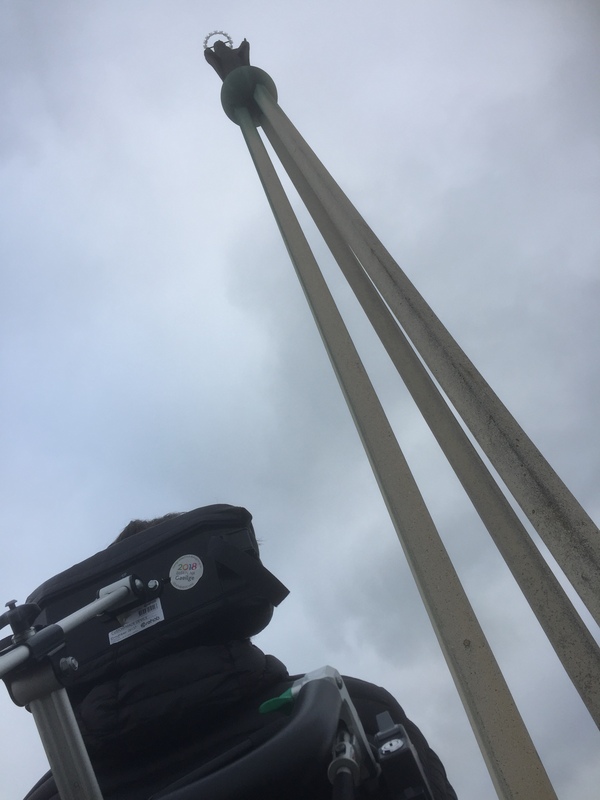 And as Pádraig was sitting there for a few seconds while we were getting ready to go, he all of a sudden started to push the bars out – not just once, but several times. We had just not given him enough time before to try and do this by himself. The weather here is great for walks. Hardly any wind and very mild temperatures. So we went to Dollymount and walked along the man built sea barrier out to the statue of Mary. The place was jammed with people, all of us enjoying the fresh sea breeze. For a few days, we’ve been eating turkey and ham, and by the looks of it, supplies will stretch over another couple of days. – Tomorrow, I’ll look up a turkey & ham curry recipe!